A healthy environment must have clean air. If other aspects of our way of life – our use of cars, our factories and power plants, our sewage treatment systems, our cigarettes, or the paint we put on our walls – makes the air around us unhealthy or unpleasant, then we are not living in the kind of society that we want to sustain. Air quality in New Jersey has improved over the past twenty years. This indicator shows the number of days on which ground level ozone, particulate matter, or carbon monoxide was measured to be at unhealthy levels somewhere in the state. Since 1983, this has dropped markedly, by almost 90 percent. 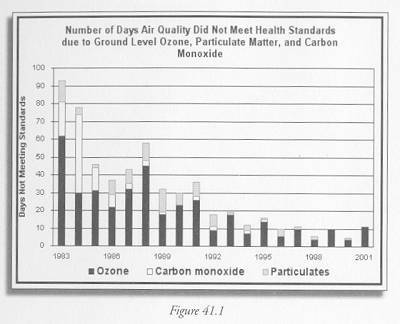 The number of unhealthy days caused by ground level ozone dropped from 62 to 11 between 1983 and 2001. In 1983 there were 12 unhealthy days caused by particulates and 19 caused by carbon monoxide; both were zero in 2001. The Department of Environmental Protection targets are to have no unhealthy days due to ozone or particulates by 2007. We achieved the particulate standard in 1999 and 2001, although not in 2000. We have made substantial headway on the ozone target, although we are not there yet. While this indicator gives a good general impression of trends in air quality, it is important to remember that it does not tell us how much of the state was at unhealthy levels, or by how much they exceeded safe pollutant levels. A measurement just one percent above the standard will show up in this indicator the same way as levels ten times the standard. Similarly, we don’t know whether only one or all 47 of the state’s air quality monitoring stations registered unhealthy air quality on a given day; either way it simply shows up as a day with unhealthy air. This indicator also does not take into account the new federal air quality standards that came into effect in 1998. In fact, the state would measure much worse by those standards; however in order to retain the time series back to the 1980s, this indicator is based on the old standards. More sophisticated indicators of air quality would show how widespread the problems are, rather than simply telling us that at least one spot in the state was not healthy on a given day. Moreover, many health problems are associated with poor indoor air quality, which is not measured in any systematic way in New Jersey. Improved data would give us a better understanding of the problems, so that we could more easily determine the causes. By 2007, there should be no unhealthy days due to ozone or particulates.